Lucy loves the paper shredder toys ... without a doubt those are her favorite toys. Only thing that drives me crazy is you spend $15 on one and she has it gone within 24 - 48 hours. Good thing is we went to the 'All About Pets Show' in Toronto yesterday and picked a couple up for $8 each. We got 10 toys/perches for a little over $80 at the show yesterday. He also loves anything with pieces of wood on it ... she's definitely a chewer. Jessie loves his acrylic toys with dice and bells hanging. He loves to hang upside down and swing back and forth right beside them ... you can tell he's happy as can be, but man does it ever make a lot of noise Doesn't bother me, but my step-kids says it drives them crazy when they are trying to sleep in. Jessie also loves those balls that has the leather straps, ropes and pieces of wood wrapped in paper. Again, those are usually destroyed within a couple of days. I think Michael showed a picture of Kili with a toy made out of pasta. I'll have to try that, because I just started giving Lucy and Jessie raw and cooked pasta and they love it. So I'll have to make a toy out of it and I'm sure Lucy will love chewing on the raw pasta. 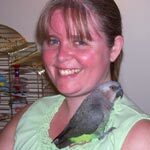 I like the Snack Rack Bird Toy, a Puzzle Wheel, cardboard shredder boxes, and an acrylic “treasure chest” with two keys that need to be turned and pulled to reveal the treat.MY parrots enjoy with toys. Jasper hasn't really played with anything much in his cage. I think his favorite toy at the moment is my computer desk. He doesn't bite it or anything but he loves just running around on it. I seriously have to get on with finding him some more toys to play with once he gets better acclimated with his cage. .I've heard you can use cut up paper towel rolls as shreddable toys. Is this safe? my lorikeets fav toy right now is me, hes at the clingy cuddly stage, hes 12 and a half weeks. Out of the budgies, Finn likes reflective surfaces and hanging greens best; George and Ralph both love hanging greens and bells. chico has a big thing about squeaky balls at the minute, i bought six in a pack with paw prints on and he has chewed everyone and got the squeaks out, now theres big holes in them and i hoover up the bits.